You can’t go wrong with classic flavours, which is exactly what this is all about. The skin is baked until golden brown, but the real beauty is the sweet white lotus paste filling balanced with two salted double yolks, and speckled with macadamia nuts for added texture and flavour. Best of all, it’s made using 30 per cent less sugar. We recommend: Clipper Tea’s Summer Passion Fruit tea, a gorgeous blend of Ceylon black tea, marigold flowers and passionfruit. Its rich and full-bodied taste will cut through the mooncake’s heaviness, while the fruitiness will enhance the nuttiness. It’s equally easy to feast on this alternative without guilt, as the sweet and luscious white lotus paste, paired with a sprinkle of crusty macadamia nuts, contains less sugar. The filling also boasts two yolks, encased in a slightly thick crust, and baked to a glistening, golden brown finish. We recommend: Clipper Tea’s All Day Breakfast tea, an invigorating jasmine green tea sourced from the Fujian province in China. It’s known for its fragrance and floral sweetness, and will not overpower the white lotus paste’s subdued taste. Executive Chinese chef Mok Kit Keung makes his signature mooncake flavour available here for the first time. And we’re sure it’s going to be a hit, especially the scrumptious custard paste option enhanced with bird’s nest bits. We recommend: Eu Yan Sang’s Oriental Beauty tea, known for its smoothness with just the right amount of honey sweetness. It blends well with the custard filling without overwhelming the palate. It’s a wholesome and earthy combination of apricot kernels, nuts, and pumpkin and lotus seeds. The nuttiness blends well with the saccharine candied winter melon and sundried persimmon, making for a perfect serving of textures and flavours. We recommend: Eu Yan Sang’s Oolong Heavy Scented tea, made with 100 per cent natural Taiwanese tea. It’s light and dry, but has a sweetness that’s punctured with stronger roasted notes to bring out the mooncake’s flavours. Pandan is a well-loved ingredient here in Singapore, which is, perhaps, the inspiration behind this new creation. The irresistible golden baked exterior gives way to the pandan lotus paste filling that hides a delectable red bean core; the latter is studded with melon seeds for additional crunch and texture. We recommend: Mister Wu’s Canton Black Lychee tea, which has an aromatic Christmas spice that comes from ageing the black tea and dried lychee. The irresistible fruity finish is the perfect marriage with the pandan flavour. These days, healthful and delicious are two qualities we look for in a mooncake. And this variety delivers with its use of Chinese black dates. These are painstakingly smoked to give them that desired smoky flavour that pairs well with the sweet melon seed paste. We recommend: Mister Wu’s Brown Butter Oolong tea which has a malty aroma and smoky notes that accentuate the black dates. The smooth nuttiness of the tea cuts through the richness of the date and melon seed paste. We love this mooncake for its smooth matcha paste, enhanced with flowery notes. The fragrant nuts also give it textural contrast in every bite. We recommend: Mister Wu’s West Lake Sencha tea, with a nutty grass flavour that pairs well with the matcha paste. The leaves are sourced from Hangzhou, China, which produces one of the best Sencha which can rival the Japanese varieties. For something different, we’d go with executive chef Nicky Ng’s version any day. Taking inspiration from the classic French mille-feuille, the decadent and smooth yam paste is balanced with a salted egg yolk and crunchy pistachio nuts, and sheathed in a light, airy and flaky crust. We recommend: Newby Teas’ Earl Green tea, made with natural tea leaves infused with citrusy notes from the bergamot orange. Its zestiness is also a good match to the sweet-savouy and flaky mooncake. 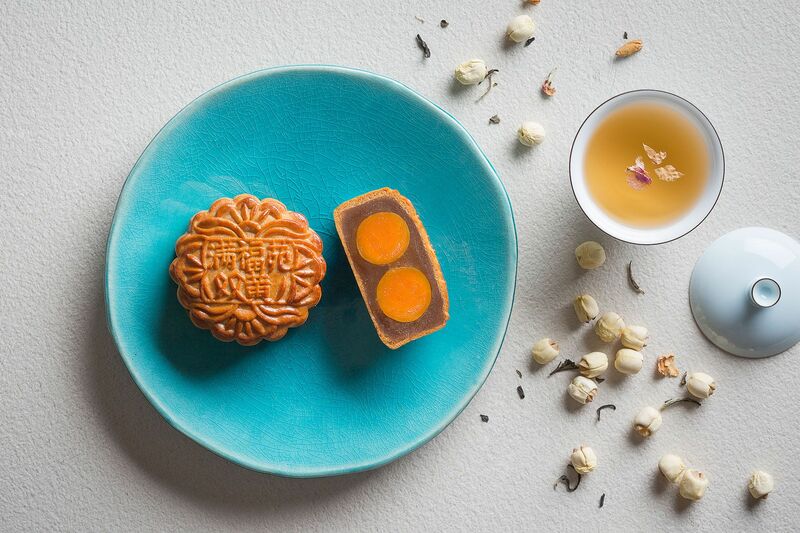 This mooncake is as indulgent as it gets, so we appreciate its petite size. But it still has all the delicious flavours we expect from being paired with golden salted egg yolk encased in soft, buttery custard and baked crust. It’s recommended that you heat it in the microwave for five to six seconds to let the filling ooze. We recommend: Newby Teas’ Milk Oolong tea with a decadent creaminess that teases the palate. The semi-fermented leaves are steeped in fresh milk before they’re roasted to bring out the caramel flavours, with a hint of floral notes. This produces different layers of flavours, which plays up the custard flavours.